Fans that attend the event have the opportunity to enter to win Chargers tickets for the November 22nd Chargers vs. Broncos game! 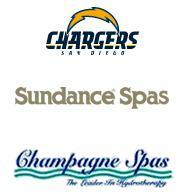 The lucky winner will compete for a brand new Sundance® spa on the field during half time! In addition, fans can get their picture taken with the Chargers cheerleaders and receive a free Chargers football from 11 a.m.-1 p.m.! Entertainment from radio stations KGB 101.5 & and XTRA Sports 1360 AM and free food will be provided! Join the fun and savings this Saturday only!